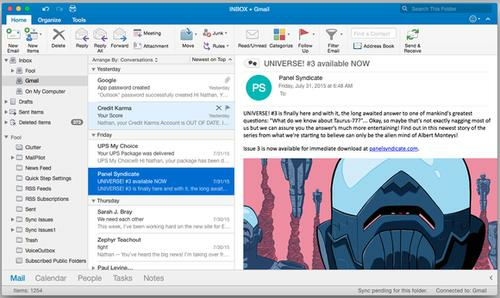 Cluttered icons aside, Outlook 2016 gives its interface a modest but appealing update. The more things change, the more they stay the same. The new Outlook 2016 for Mac is the same solid, dependable, occasionally cluttered app it's always been, for good or ill. If you're looking for must-have reasons to upgrade to the new Office suite in order to get the new Outlook, you won't find them here. Unless you rely heavily on Outlook's still-superb integration of mail and calendars, you can probably find nimbler, more innovative email alternatives. Microsoft's Office blog excitedly touts three major new features of Outlook 2016. First, push email support means that new mail shows up in your inbox as it arrives, without requiring you to check for it. This is definitely convenient, especially for business users who can't afford to miss a message even by a few minutes. But it only brings the app version of Outlook up to par with its web-based Outlook365 version, not to mention rival web clients such as Gmail. Second, the first sentence of a given email now shows up beneath its subject in the message list, giving you a better sense of whether it's worth reading without previewing it. Again, undeniably handy, but Apple Mail and other clients have offered an identical feature for a while now. Third, a new conversation view gives you the option to group messages by thread, keeping every back-and-forth in a particular email exchange close at hand for easier reading. This idea's also nothing new, but it makes good sense. However, its implementation in Outlook 2016 leaves something to be desired. You have to choose to sort messages by conversation--rather than a host of other filters, from date sent or received to the account they came from--in order to see them displayed this way. Outlook basically apes Apple Mail's practice of showing a list of subject headers within the thread underneath the thread itself. To its credit, it also lets you delete or flag individual messages in the thread by rolling over those headers in the list. If you don't sort by conversation, you'll only know a message is part of a thread if, after clicking on it, you see a speech-bubble button in the top left corner of the right-hand reading pane. Whether you click that button or use the dedicated conversation view, you're still only shown a list of message headers and--in the former case--first-sentence previews. You'll still have to click through each one at a time to follow the thread, which robs this feature of a lot of its time-saving usefulness. In Apple Mail and other clients, you simply click once to open an entire thread and scroll through its contents in chronological order. Outlook 2016 also adds the long-overdue capability to create custom email signatures, although I liked its option to designate different signatures for different accounts, and for new messages or replies within those accounts. In addition, it now syncs your category names and colors across its Mac, PC, and Web versions, and lets you archive messages online to free up space in your mail account. Minor adjustments aside, you'll find all of Outlook's usual strengths and shortcomings in its newest version. Its best qualities include the smart and highly usable way that the program ties together email, tasks, and calendars. New features here include side-by-side displays of multiple calendars, weather forecasts for your area, and the ability to propose a new time when invited to a meeting. I also have nothing but praise for Outlook's account setup skills. Adding both my Office365 account from work and my personal Gmail account took mere seconds, and required nothing more than my email address and password. Outlook 2016's savvy configuration tools did the rest, and after some initial loading, all my mail popped into view. Most of the Outlook's modest 2016 facelift is perfectly pleasant. Navigating between Outlook's different abilities--Mail, Calendar, People, Tasks, and Notes--is as simple as clicking those words at the bottom of the main window, and within each view, the information you need is laid out clearly and conveniently. I liked the calming, easy-on-the-eye interface colors, too. However, the ribbon running across the top of the window still has yet to meet an icon it didn't like, cramming them together in inconsistent sizes and configurations. Outlook 2016 can also occasionally take its sweet time launching, or checking for new mail when it first opens. It's Microsoft Outlook: You almost certainly know what to expect from it. It does its job well, but brings nothing new to the table. If you need Exchange-based mail for work, or want a desktop alternative to the very good Outlook365 web client, it won't let you down.